Making waves . . . This past December 6th, at 3:06 PM, after reading and rereading, and rereading several more times, I finally clicked the “publish” button of the very first post of my newborn blog page. This blog was created on the spur of the moment; few days earlier, I threw the idea to one of my students, she had a blog of her own and advised me to look into Word Press. Over the weekend, I checkout the site, created my page, and on Tuesday … voilà, Sharing My Italy . . . the Blog, was born and traveling in cyberspace! My dream of sharing my country with the world was turning into reality. 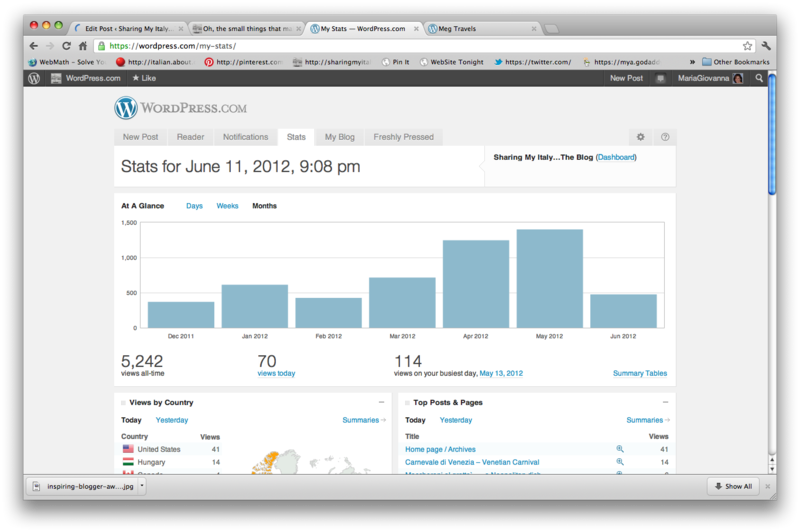 Today, six months later, after clicking the “publish” button 47 more times, my little blog has received over 5000 hits!!! It might not seem a lot to some of you, but it sure seems a lot to me, and I am celebrating. 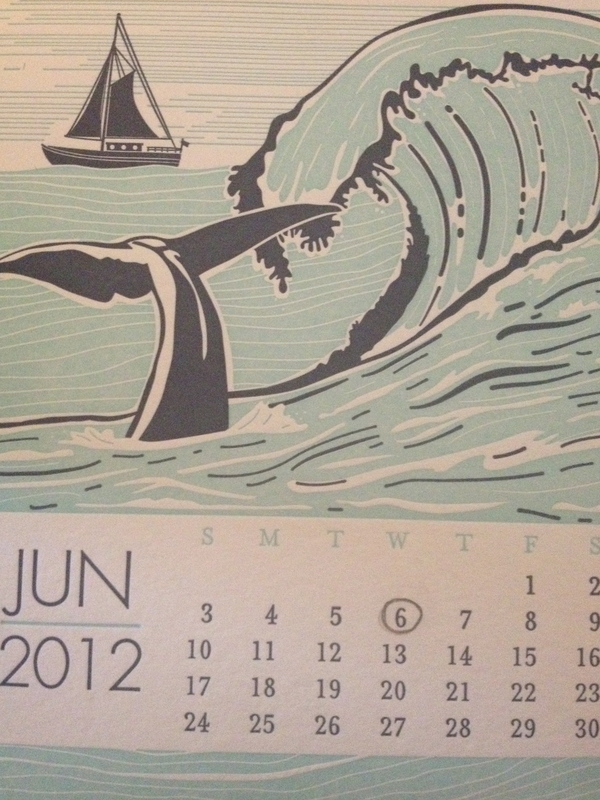 Few days past June 6th. 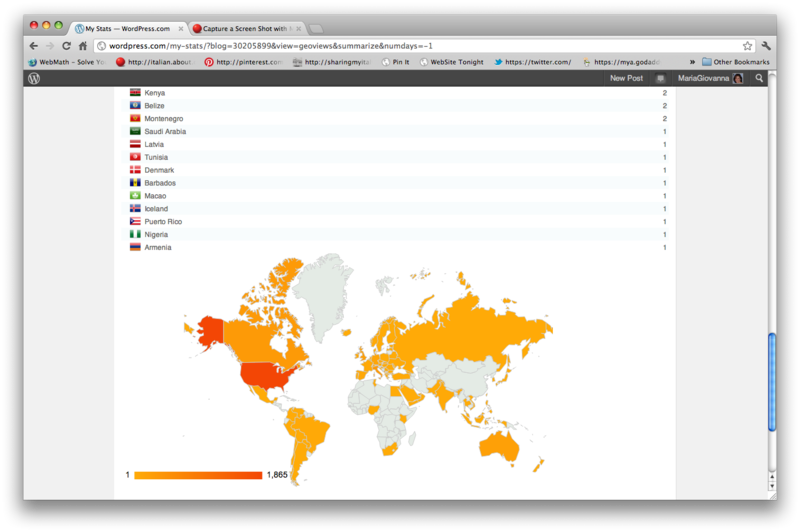 And look at how much color on the world map….82 Countries and counting! No, it is not the board game, Risk, but at time, it certainly feels like it! There is a total of 193 countries in the world and in almost half of those, at least one soul, has read one of my posts . . . I am exhilarated. Who knows, may be one day one of my posts will make it to the Word Press’s “Freshly Pressed” page . . . now, that would call for a major celebration! This past Easter, I wrote a post to express my gratitude to all my followers and readers. I rambled about the excitement and the anxiety that comes with the act of publishing each post, the staring at the stats and waiting for a comment or a “like”. It is not much different today, however, I am a lot more relaxed and when I feel uneasy, I remind myself that the purpose of this blog is the pure enjoyment of putting into words my love, knowledge and appreciation for my beautiful Country. And to be able to share it with half of the world it is pretty darn good! Doesn’t just the name sounds marvelous? Grazie, grazie, grazie to Meg Travels for the nomination! Meg has a beautiful and inspiring blog herself and I encourage you all to visit. She has just return from a trip in Italy and you will love to read what she is sharing. First, acknowledge and thank the giver, link it back, and put the award on your page. One more time Grazie Mille Meg Travels! Next, list 7 things about yourself. I suppose I should tell you something that I have not already told about myself, so since Italy is not the only thing I love, I will reveal few more of my favorites. I assume you already know that my greatest love are my amazing sons and wonderful husband. And of course, to my family across the ocean: I love you all! Wow, now it sounds like the Academy award acceptance speech; good thing there is no music interrupting me and I will never know if by now, by boredom, you have switched to a different page. I love art . . . a day at a museum it is a good day for me. I love fine shopping . . . window-shopping would do it too. I love fashion . . . Italian, mostly! I love to travel . . .everywhere. I love to read . . . fiction only. I love to sketch my dream home . . . I have “many” sketches. I love my two dogs, Luna and Vera . . . they are the reflections of our family: fun, loving, playfully mischievous, and just wonderful. Last, pass the award to 7 bloggers who inspire you. Congratulations to all and to an even brighter tomorrow! Congratulation on your award and thank you for sharing it with me. I find Italy so inspiring and your posts take me back there time and again. Love it! You deserved this award as well, so congratulations to you! And I hope you will keep enjoying my posts. Thank you for your kind words, I really appreciate the support. And indeed I enjoy your blog. You should definitely go to Naples, I have a feeling you will love it . . . I hope! Yes, do that. . .it will be wonderful! So much to see, to love, to hate, to eat and then to write about it! Congratulations and many more “hits” and posts to come! Thank you so much and btw I am loving your blog and new logo! Grazie and thank you for stopping by! Thank you! I appreciate you taking the time to leave a comment.